For as long as the outside world remains freezing cold and my radiator is turned up atrociously high (I’m like a roast chicken most of the time), my skin will remain dry, flaky and downright disgusting. I can drink as much water as I like in a bid to get the dry skin to go away but I’m permanently fighting a losing battle. The only solution is a really good, greasy moisturiser. Enter Lush’s Celestial. 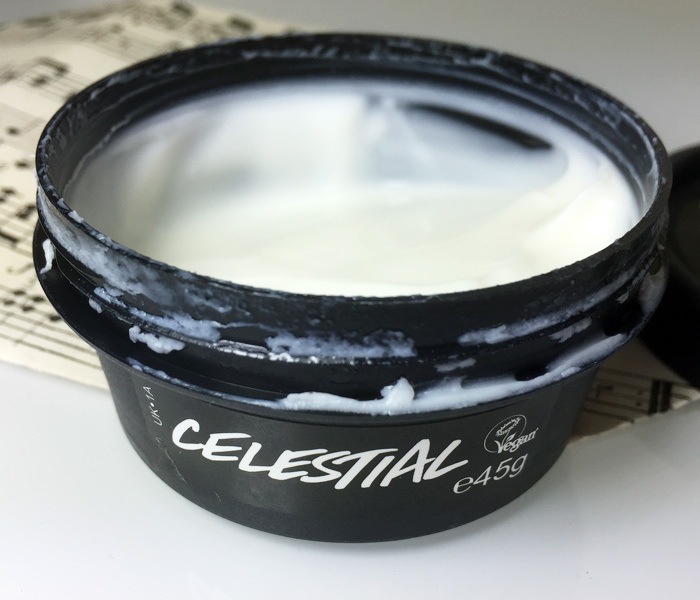 I randomly picked up Celestial during a Lush shopping spree one day and pretty much hoped for the best. I wasn’t expecting too much from it as I’ve found Lush facial moisturisers and I don’t typically get along. 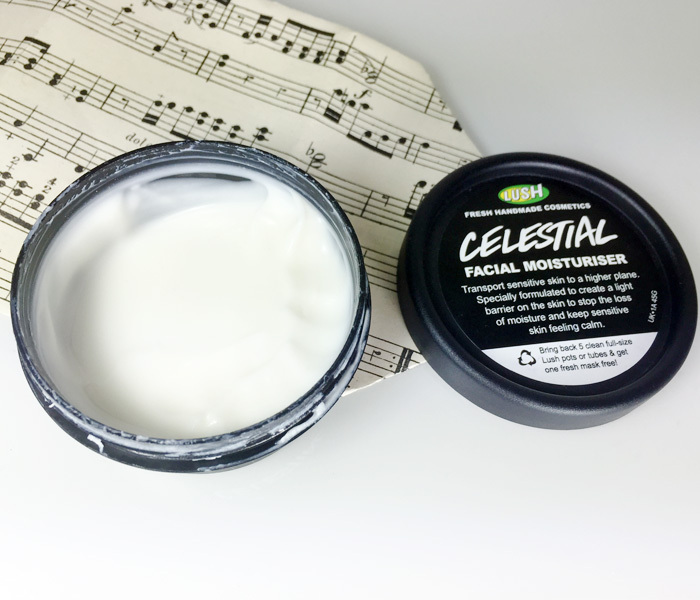 In order for me to like a moisturiser, it has to be thick and scent free which Celestial almost delivers on. There is a mild medicinal vanilla (yes you read that right, medicinal vanilla) scent to it which isn’t exactly pleasant but it’s subtle enough to the point where it can be ignored. Celestial also has a very thick consistency and is exactly how I like it. Due to the heaviness of Celestial, it does leave your skin looking and feeling a little greasy once it’s applied. It’s fine right before you go to bed when no one is going to see you but it’s not so great in the morning. I tend to let Celestial sink into my skin before I even attempt to apply make up as I know it’ll make anything I dare put on my face look atrocious. I find the greasiness of Celestial is pretty much gone by the time I’ve finished a bowl of incredibly sugary cereal. As for the actual moisturising effects of Celestial (y’know, the whole purpose of the product) I cannot fault it. It contains things like almond oil and organic cocoa butter which my skin always loves and responds really well to. I don’t think I’ve used a moisturising product as good as this from Lush since I first used Celebrate body lotion. Celestial may not clear up every single dry patch but it definitely does an amazing job at helping my skin battle the cold weather and artificial heat. 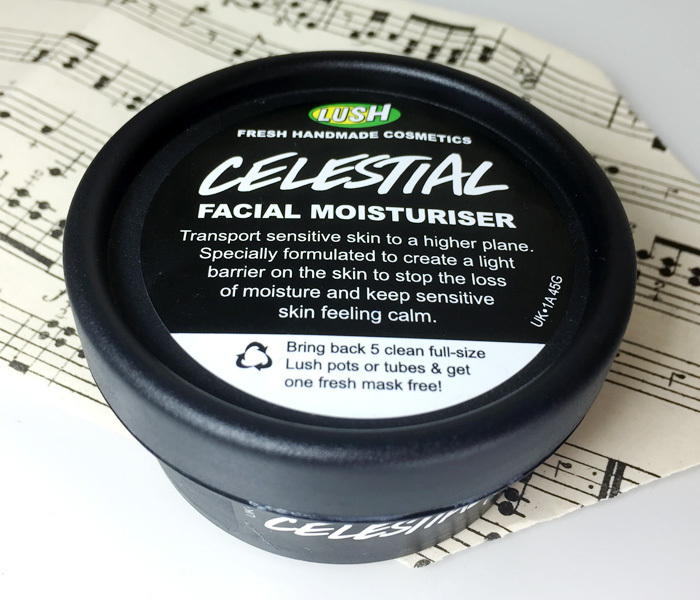 Celestial is definitely going to become a firm favourite product from Lush but I probably won’t have to repurchase it for quite a while due to how little I need each time I apply it. It’s one of those products that anyone who suffers from dry skin in Winter needs in their arsenal, that’s if you can stand the rather strange scent of course.